ICICI Bank Ltd (ICBK) is the stock which started its journey from low 03 [traded in price 03-43 from January 1999-2001) and bounced sharply by more than 600% after 2001 to register high 264 in 2008. Later, this stock corrected by more than 80% from 264-46 and bounced back again to register its fresh all time high 365 in 2018 and presently has trading around 313. This is Monthly time bar chart of ICICI Bank Ltd (ICBK) covering its life time move from 1997-2018. All time low of this stock is 03 so the wave cycle of this stock is started from 03 in 1999. It seems wave completed from 03-264 may be bigger wave (1), wave completed from 264-46 may be wave (2) and wave (3) may be in progress from 46. Within bigger wave (3), it seems wave (i) may be completed at 232, wave (ii) may be completed from 232- 164 as Irregular correction and wave (iii) may be in progress from 164. Wave (iii) achieved its minimum 100% projection placed at 350 but there is no limit for projection of wave (iii), it can project anywhere without any limit. And within wave (iii), it seems wave  may be completed at 365 and wave  may be completed at 256 or still in progress. Overall, this stock has very good potential in long term because major wave (1) is of 261 points and we can expect major wave cycle (12345) to complete minimum 3 fold of wave (1). So, this stock can achieve minimum 783 in long term and there is no upper limit. Let’s see pattern of decline from 365 on separate daily chart to checks its inner wave counts for more clarity. This is daily time bar chart of ICICI Bank Ltd (ICBK) covering move from 365 which I am expecting start inner wave  of wave (iii) on previous chart. It seems wave completed from 365-259 may be wave (A) but the later bounce from 259-317 and further decline from 317-256 is (abc) move. 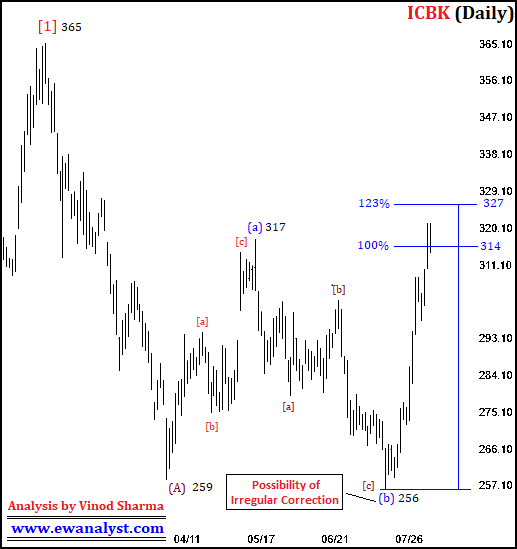 So, wave (B) may be in progress from 259 as Irregular Correction with inner wave (a) may be completed at 317, irregular (b) may be completed at 256 and wave (c) may be in progress from 256. 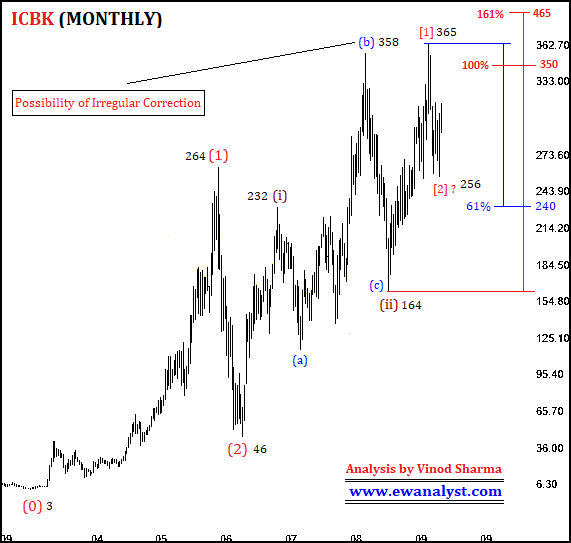 Normal 100%-123% projection for wave (c) of (B) is placed at 314-327 which is the minimum expected range for completion of wave (c). But wave (c) can complete before 100% also in Irregular Correction. So, if it is really wave (B) in progress as Irregular Correction from 259 then this stock needs to register one more low below 256 before achieving new life time high. For Long Term: – This stock has very good potentials for long term because it is within its inner wave (iii) of major (3) and has long way to go. This stock can achieve minimum 783 in long run [3 times of wave (1)] and there is no upper limit. But there is possibility of upward Irregular Correction from 259 and there is possibility of one more low below 256 before registering new life time high. So, safe investment strategy is to accumulate this stock below 256 in SIP mode and hold for 3-5 year expecting minimum 783 which can extend even higher. For Medium Term: – There is a possibility of irregular correction at bottom from 259, so this stock can give one more decline for below 256 before any bounce for a new high. This condition can be used for trading with stop loss but we need to wait for low risk opportunity and it needs a continuous watch.